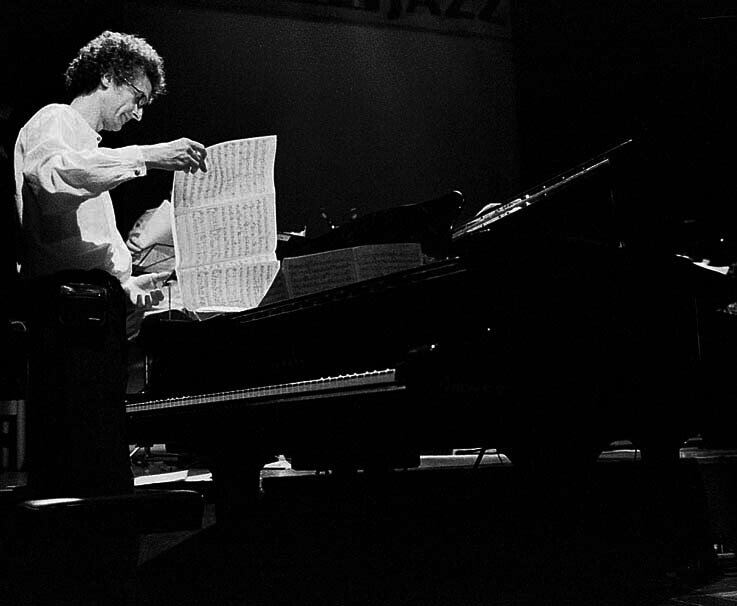 Besides his numerous achievements as a jazz pianist, Michel Herr, from the early years of his career, got interested in writing his own music. It was the case for his first bands like Solis Lacus, his trio, and later his quintet, nonet ("Life Lines"), his quintet + string quartet etc.... This activity thus rapidly expanded to ensembles of various sizes, up to the big band and beyond. Over the years, he had the opportunity to write for several soloists and European bands as well as for radio and TV, which earned him a solid international reputation as a composer/arranger. His first experiments in big band writing date from the late 70ies, when he got invited by bandleader Etienne Verschueren to write for and to conduct the BRT Jazz Orchestra (Flemish radio big band). Later, he was co-leader, musical director and main composer for Act Big Band, an all star Belgian jazz big band wich played many concerts and festivals and recorded some albums (LP "Act Big Band" and CD "Extremes", featuring Joe Lovano & John Ruocco). In 1984, Toots Thielemans and a large orchestra conducted by Rogier Van Otterlo play his piece "Thinking of You", live in a festival in Antwerp. In 1988, his composition "Labyrinthe" won the First Prize of the famous "Concours International de Composition de Thèmes de Jazz" of Monaco, a contest previously won by Martial Solal and Peter Herbolzheimer. In 1993, he wrote the film soundtrack for the Belgian movie "Just Friends", by Marc-Henri Wajnberg (numerous awards), a jazzy soundtrack on which he can also be heard with Archie Shepp. On the occasion of the concert organized for Toots Thielemans' 70th birthday in Brussels, he was one of the three composers/arrangers who conducted the big band. The other two were... Quincy Jones and Peter Herbolzheimer. His composition "Unexpected Encounters", commissioned and recorded by the Belgian TV BRTN in 1995, features the Michel Herr European Quintet + a string quartet. In 1996, he composed his "Celebration Suite". He conducts the premiere performance by the Brussels Jazz Orchestra and conducts the band again when they record the piece in '99 (CD The September Sessions) and later in 2007. In '98, Michel Herr wrote for Act Big Band "Les Intermittences du coeur", a piece dedicated to French writer Marcel Proust. The piece was created at the "Jazz à Liège" Festival and broadcast by Belgian radio RTBF. The same year Act Big Band was elected Best Belgian Big Band of the year, both in the listeners poll (RTBF/VRT) and the critics poll (French speaking) and in the critics poll, Michel Herr entered the Hall Of Fame for his career achievements, and was elected Best Belgian composer and Best Belgian arranger. For the grand opening of the Flagey cultural center in Brussels (in the renovated buildings of what used to be the facilities of the Belgian radio and television), he received the commission to write a piece for the Brussels Jazz Orchestra. His suite, titled "Flagey, a New Era", was created on Sept. 30, 2002, with Toots Thielemans as a soloist and Michel conducting the band in person. In February 2003, the WDR Big Band invites Michel to conduct and record almost two hours of his own compositions. A studio recording for the WDR radio is followed by a live radio recording of a very succesful concert given at the Stadtgarten, in Cologne (Germany). He forms a nonet, "Life Lines", and in 2005, he is the guest of honor of the evening of the Belgian "Django d'Or", and presents his compositions written for a tentette which includes some of the finest jazz musicians from Belgium : Bert Joris, Steve Houben, Fabrice Alleman, Phil Abraham, Chris Joris, Jacques Pirotton, Sam Gerstmans, Dré Pallemaerts (tv broadcast). This nonet has since played several concerts and festivals, and in a tentet version, "Life Lines" recorded one track, "Tolerance", on a CD commissioned by the Belgian Olympic Committee in 2008 under the title "JazzOlympics". In May 2007, he records a double album of his big band compositions with the Brussels Jazz Orchestra (released by De Werf in Feb. 2008). In 2008, he composes for sextet (a.o. with Steve Houben) "A hip taxi", especially written for the tv programme "Hep taxi" (RTBF). In 2009, he writes "Last minute blues" for the cd "Bad influence" of trumpet player Gino Lattuca with guitarist Philip Catherine. Beginning of 2010, he composes "Bridges", for the quartet of saxophonist Fabrice Alleman and the chamber orchestra "La Chapelle Musicale de Tournai". In 2011, he writes "For a smile", a piece for the Brussels Jazz Orchestra and its project "Graphicology" (Jazz and comic strips). His compositions have been recorded and/or played by soloists such as Joe Lovano, Tom Harrell, Judy Niemack, Fred Hersch, Kenny Barron, Ali Ryerson, Bill Frisell, Archie Shepp, Toots Thielemans, Philip Catherine, Ivan Paduart and many others. See a list of Michel Herr's jazz compositions. Photo © Jos L. Knaepen Since the beginning of his musical career, Michel Herr had the opportunity to write hundreds of jazz arrangements, for all kinds of ensembles : small bands, big bands, strings, chamber orchestras, choir, sax sections etc...and in various contexts. In 2004, he writes and records an arrangement of "Between You and Me" for quintet and string quartet, for the album "Sides of Life" of saxophonist/composer Fabrice Alleman. He also arranges for quartet and strings two pieces by Ivan Paduart played and recorded by the pianist, Richard Galliano on accordion and the "Ensemble Musiques Nouvelles" for the album "Douces Illusions" (2004). In 2005, he contributes with his string arrangements to the CD "On the Jazz side of my street" (Igloo) of songwriter and vibraphone player Guy Cabay. In 2006, he writes a string arrangement for the accordeon player Tuur Florizoone (concerts in Colombia). In 2007, for the album "Changing Faces" of singer David Linx with the Brussels Jazz Orchestra, he writes a suite on Joni Mitchell's "Black Crow". The same year, he also writes an arrangement on Ivan Paduart's "Waterfalls" for the Dutch singer Fay Claassen and the famous Dutch "Metropole Orchestra", a large orchestra (big band + strings + woodwinds, etc...) which for decades has invited the top arrangers of the world. In 2008, he arranges a song for singer David Linx and the Brussels Jazz Orchestra for a CD commissioned by the Belgian Olympic Committee under the title "JazzOlympics". The success of his first collaboration with the Metropole Orchestra in 2007 led in 2008 to 5 more arrangements for this ensemble on Ivan Paduart's music, this time with soloists Fay Claassen (vocals/NL) and Bob Malach (tenor sax/USA), with Jim McNeely as a conductor. All 6 arrangements were played in a unique and acclaimed concert in Brussels and recorded for Belgian radio (VRT) and Dutch radio (NPS) and television (VRT). On Youtube, listen to Waterfalls, Another lifetime and Life as it is. In 2009, he is the musical director and arranger for the tribute cd to Paolo Radoni, titled "Radoni's Tribe : Let me hear a simple song", which received the "Octave de la Musique" award (B) in 2010 in the jazz category. For 2010, he writes all the arrangements for a project featuring the quartet of saxophonist Fabrice Alleman and the chamber orchestra "La Chapelle Musicale de Tournai". The same year, during the Saint-Jazz-ten-Noode Festival in Brussels, Michel Herr was the musical director and arranger of a special project, which saw 25 young Belgian jazzmen play pieces by musicians of the previous generation (Philip Catherine, Steve Houben, Phil Abraham, Marc Moulin, Diederik Wissels, Jean-Pierre Catoul, Paolo Radoni, Peter Hertmans, Pierre Van Dormael etc ... and himself). 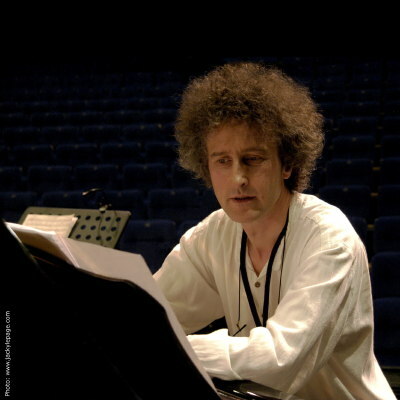 In 2011, he writes 13 arrangements for the project "Colors of time", on compositions by the Swiss pianist and composer Thierry Lang, for David Linx (vocals), 4 jazz musicians, a large choir (L'Accroche-Choeur) and the strings of the "Orchestre de Chambre Fribourgeois". The creation in May 2012 in Fribourg (CH) was a resounding success. An album comes out in 2013. Still in 2012, he writes some arrangements for a project of saxophonist Fabrice Alleman, featuring an international quartet composed of Fred Favarel (gt), Reggie Washington (bass), Minino Garay (perc.) augmented with a string quartet. In 2014, he writes arrangements for the project "An American songbook", with Steve Houben (sax), Julie Mossay (classical soprano), the Nathalie Loriers trio and the Orchestre Royal de Chambre de Wallonie (strings). On the occasion of the Adolphe Sax year, he writes a series of arrangements for 5 saxes and the trio of Nathalie Loriers, "Michel Herr & Steve Houben present the Real Sax Section". In 2015, he wrote some arrangements for guitarist Philip Catherine and the strings of the Orchestre Royal de Chambre de Wallonie (conducted by Frank Braley). He also arranges a new version of "Colors of Time" (Thierry Lang/David Linx), 13 arrangements for 5 jazzmen and chamber orchestra (strings, woodwinds and horns). In 2017, he completes and records the project of saxophonist Fabrice Alleman + chamber orchestra, "Udiverse". He also writes 2 string arrangements for the album of fusion bassist Daniel Romeo "The black days sessions". With the acoustic guitarist Francis Goya, he recorded with his own trio a dozen of re-arranged instrumental versions of songs by Jacques Brel. He wrote string quartet arrangements for funk bassist Daniel Romeo album. And an arrangement for bandoneonist Manu Comté & B Strings, on a piece inspired by Astor Piazzola, with Tomás Gubitsch (Piazzola's guitarist) and a string quintet. Michel Herr also wrote music for movies and media (radio, tv, etc...). See more details here.